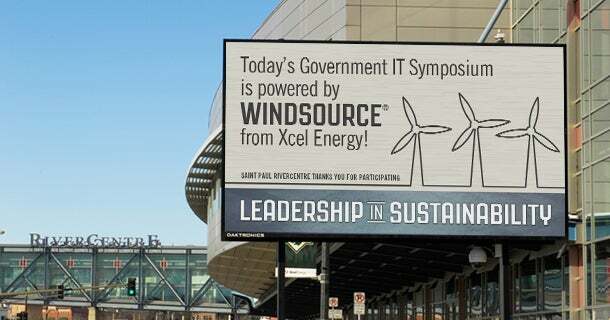 Windsource® for Events is a renewable energy program from Xcel Energy through which event planners can choose to offset the energy usage of their event with the purchase of wind power. This program is offered for events held at Saint Paul RiverCentre, Xcel Energy Center and Roy Wilkins Auditorium. The energy comes from 20 Minnesota wind farms whose output is dedicated to this voluntary program for homes and businesses. Allows events of any type to reduce their environmental impact. Appealing to clients, attendees, exhibitors and fans who care about environmental issues. Relatively inexpensive, simple and easy to execute. How much will it cost to purchase Windsource for my event? Depending on the size of your event, the energy it requires and the current price of wind power, it costs about $200 to $500 per day to implement Windsource at Saint Paul RiverCentre, Xcel Energy Center or Roy Wilkins Auditorium. On average, one day of Windsource at these facilities offsets the energy use equivalent of 2-3 American homes over a whole year! How do I sign up for Windsource? Your event manager can provide you with a more accurate cost estimate for your event and help you with the paperwork required to get it set up. As regional leaders in sustainability, our facilities strive to make it as easy as possible for events to join in our sustainability efforts.